What's the Deal with Kewpie Mayo? While Duke's Mayonnaise may be the crown jewel of the South, but Japan is obsessed with Kewpie mayo (and we are, too). The red and white checkered plastic bottle with its iconic baby logo has been appearing in more and more grocery stores as it is no longer a specialty item lost amongst the Asian market aisle's impossible-to-read labels. Kewpie mayo has been a staple at my house for years, but why? What's the deal with this mayo and what makes it so much better than its American made counterparts? According to their website, Kewpie was born in 1925. Its inventor, Toichiro Nakashima, was trying to improve the physique of the Japanese people. So, he used twice as much egg yolk as his nearest imported competitor. Since then, Kewpie has become the most popular condiment in Japan and is the standard for Japanese mayonnaise. Its popularity really can't be underestimated in Asia. Kewpie is available on almost every restaurant table and people use it for everything from salad dressing to a topping for vegetables. Now, in addition to mayonnaise, Kewpie USA makes a whole line of dressings, from Mango Chia to Wasabi Coconut. All of these dressings are non-GMO certified by the Non-GMO project. Kewpie uses a special machine that's designed to make its mayonnaise super smooth. Normally, when you emulsify vinegar and oil, large molecules remain (especially when you use a whisk). The machine bashes the molecules together, forcing the oil droplets to become very, very small (2-4 mm/1000), making it creamier than homemade mayo. When you do a side by side taste test, it's not only the texture you notice. Kewpie is more satisfyingly rich and sweeter than Hellman's (for example). That's because the Japanese mayo uses the egg yolk instead of whole eggs, giving the spread its rich edge and yellow color. Kewpie says it's 70 percent vegetable oil, and 30 percent egg, vinegar, and spices. The end result? 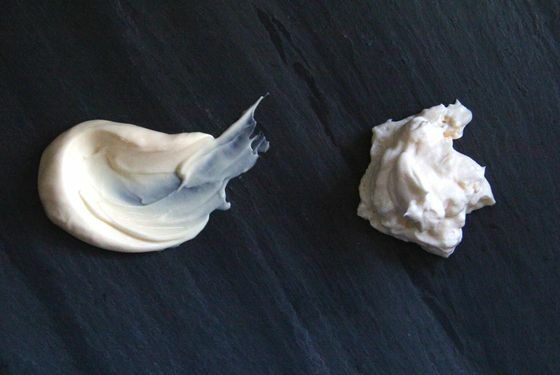 A super smooth mayo with a thin consistency and creamy texture. Its tangy flavor adds an extra level of depth to your food, making everything taste somehow magically good. It has a softer edge and an extra bit of sweetness than American mayo (thanks to the use of rice vinegar instead of lemon juice or distilled vinegar). All without using any added sugars or salt. What Really Makes Kewpie Taste So Good? It does have one extra special, secret ingredient, though: MSG. Monosodium glutamate has gotten a bad rap over the years, but it turns normal dishes into an umami bomb. What does that mean? All of your food mysteriously tastes better when you use Kewpie. Sneak it into everything from potato salad to Caesar salad dressing (it'll help it stay emulsified). Even throw it in mashed potatoes - no one will know and it'll taste phenomenal. If you're worried about MSG, you may not need to. This ingredient (which brings out umami, or savory flavors, in anything it's used in) is a naturally occurring amino that is found in foods like parmesan cheese and tomatoes. According to recent studies, MSG isn't responsible for the headaches, numbness, and nausea that it's often blamed for, and the FDA has found MSG to be GRAS (Generally Recognized as Safe). I'll be honest: I stopped buying other brands of mayonnaise. I use Kewpie for anything and eveyrthing that calls for regular mayonnaise. There are tons of recipes out there to make your own Japanese-style mayo, but you'll need to buy MSG, Japanese mustard powder, and powdered dashi to pull it off. I prefer to buy mine on Amazon with Prime shipping (who am I kidding, I always go crazy and buy a 3-pack!). Once you have the mayonnaise in hand, you can use it in everything from rich and tasty chocolate mayonnaise cake to deviled eggs. You can even fold some into your scrambled eggs to make them extra luscious. Remember when you scoffed at the banana + mayo sandwich combination? Just imagine how delicious that will be with umami-rich Kewpie mayo!